1. Preheat the oven to 160°C, gas mark 3. 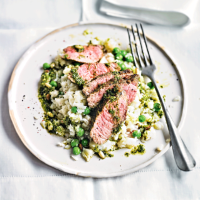 Coat the lamb with the pesto. Warm an ovenproof frying pan over a high heat. Sear the lamb for 5 minutes, turning often, until browned. Transfer the pan to the oven for 10 minutes for medium, then remove and leave to rest loosely covered with foil for 8-10 minutes. 2. Meanwhile, place a steamer or colander over a pan of simmering water. Add the cauliflower, cover and cook for 10 minutes or until tender then set aside. Blanch the peas in the boiling water for 1 minute, then drain and cool. 3.Mash the cauliflower, milk and cheese together. Stir in the peas and season. Serve immediately with the lamb cut into slices. Drizzle with extra pesto, if using.